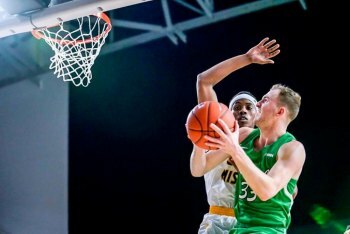 FRISCO, Texas – Marshall men's basketball (19-14) saw it's 2019 Conference USA Championship run fall short in the quarterfinals on Thursday night in an 82-73 loss to Southern Mississippi at the Ford Center. Jon Elmore led the Herd with 11 assists and eight rebounds, while scoring 18 points in the contest. The senior guard hit five of his 11 three-point shots and three of four from the free-throw line. Elmore also added a team-high three steals and had Marshall's only block in the game. Jannson Williams scored a team-high 22 points on an eight-of-14 shooting night from the field, including six makes from beyond-the-arc. Taevion Kinsey added 16 points, went a perfect four-for-four on three-point attempts, and made five of his seven shots from the field. C.J. Burks scored 10 points and brought down two rebounds. Both teams battled for the lead in first half with the lead being no lead being more than seven points in the half. The Eagles led for final 3:40 and took a 42-38 lead into the break. Neither team scored in the final 1:35 of the opening half. Southern Mississippi shot 63 percent from the field in the first half. USM led for first nine minutes of the half until Kinsey completed a four-point play to give the Herd its first lead of second half, 59-58. However, Southern Mississippi regained the lead at the 4:29 mark and didn't look back as it led the rest of the way with the final margin of nine points being its largest lead of the game. - Jon Elmore's double-double was the 20th of his career and third of the season. - Elmore is 20 points short of Skip Henderson's program leading mark. - Jannson Williams had his second game of 20 or more points this season. - Taevion Kinsey had his seventh consecutive game of 10 or more points. - Elmore's 11 assists tied for the third-most in a Conference USA Tournament game. - Marshall's 17 makes from beyond-the-arc are the second-most in a C-USA Tournament game. -37 three-point attempts by the Herd are the third-most in a C-USA Tournament game. - The six-game win streak was the longest under Dan D'Antoni. Marshall awaits to see if it will receive and accept a postseason bid.